3.7V lithium batteries are commonly used in many projects. However, The remaining power and voltage of the lithium battery are highly nonlinear. We can only roughly judge whether the battery is full or almost empty according to its voltage. 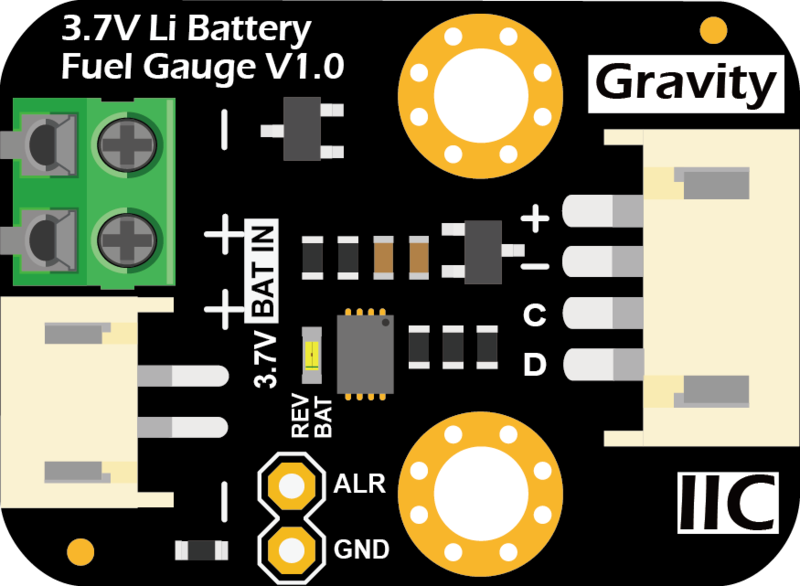 The Gravity 3.7V Lithium Battery Fuel Gauge employs Gravity I2C interface, ultra-low operating current, and real-time tracking of the relative state of charge (SOC) of the battery through Maxim's patented algorithm, eliminating the need for full-to-empty relearning and offset accumulation errors. Plug and play to accurately measure the voltage and remaining power of the battery. The module also features as a low battery power alert interrupt function. When the battery power falls below specified threshold, the ALR pin generates a falling pulse to trigger the external interrupt of the controller. You will find it a great help to estimate the battery life by learning the power consumption of the system with this module. In the solar powered projects, it helps to record the status of the battery power change in a day or even months, which benefits to understand the power balance of charge and discharge of the solar system. REV BAT Battery reverse Indicator When the battery connection is reversed, the reverse polarity protection circuit is activated and REV BAT lights up. 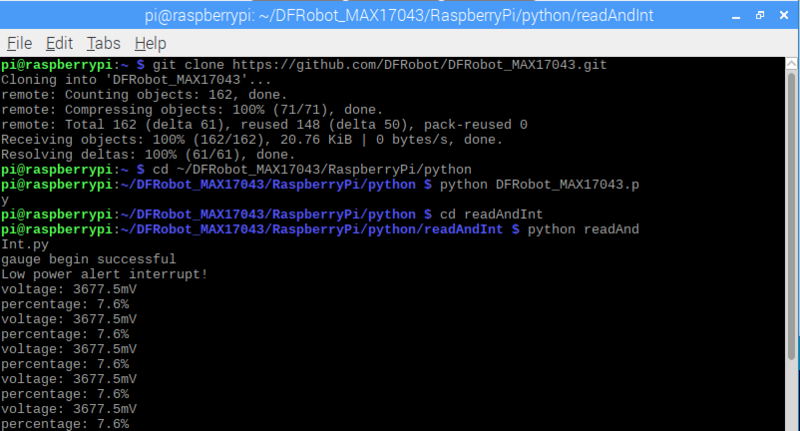 Download and install the DFRobot_MAX17043 Library. How to install the library? Connect the module to the Arduino according to the connection diagram. The battery can be connected to the 2P terminal or JST-PH2.0 2P connector. These two connectors are connected internally in parallel. The I2C address is fixed to 0x36. Open Arduino IDE, upload the following sample code to the Arduino UNO. Open the serial monitor of the Arduino IDE and set the baud rate to 115200. The module prints the battery voltage, the percentage of remaining battery power, and the interrupt alert message through the serial port. * Voltage, percentage will be printed via serial. Arduino prints the current voltage (voltage), remaining power (percentage), and interrupt alert (if any) information every 2 seconds. The default value of battery low power interrupt alert threshold is 32%. That is, when the remaining power is lower than 32%, a falling edge interrupt is generated on the ALR pin. The threshold BAT_PERCENTAGE can be set to any integer between 1-32 (corresponding to 1%-32%, respectively). This threshold can be set by the function setInterrupt(). When the battery's initial remaining power is higher than BAT_PERCENTAGE, the ALR pin is set high. If it falls below BAT_PERCENTAGE (due to discharge) , ALR is pulled to low. The controller is triggered to print ”Low power alert interrupt!”, and clear interrupt through clearInterrupt(), which causes ALR back to high immediately. When the battery's initial remaining power is below BAT_PERCENTAGE, ALR generates a interrupt at the beginning. After the battery remaining power grows higher than BAT_PERCENTAGE (due to charge) , another interrupt will be generated when the power again falls below BAT_PERCENTAGE (due to discharge). If the clearInterrupt() is not called after the interrupt is occurred, ALR remains low regardless of the battery remaining power. 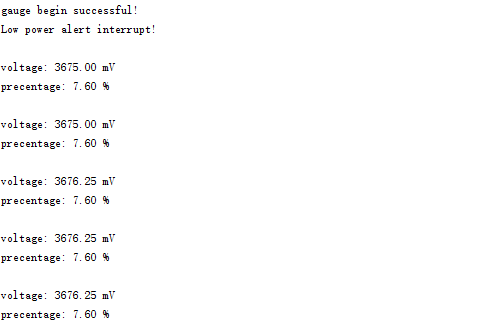 Then use the up and down keys to select “5 Interfacing Options” -> “P5 I2C” and press Enter to confirm “YES”. Reboot the Raspberry Pi. Connect the module to the RaspberryPi according to the connection diagram. The battery can be connected to the 2P terminal or JST-PH2.0 2P connector. These two connectors are connected internally in parallel. The I2C address is fixed to 0x36. RaspberryPi prints the current voltage (voltage), remaining power (percentage), and interrupt alert information (if any) every 2 seconds. The default value of the battery low power interrupt alert threshold is 32%. That is, when the remaining power is lower than 32%, a falling edge interrupt is generated on the ALR pin. This threshold can be set to any integer between 1-32 (corresponding to 1%-32%, respectively) with the function setInterrupt(). When the battery's initial remaining power is higher than interrupt alert threshold, the ALR pin is set high. If it falls below the threshold (due to discharge) , the ALR pin is pulled to low. The controller is triggered to print ”Low power alert interrupt!”, and then clear interrupt through clearInterrupt(), which causes ALR back to high immediately. When the battery's initial remaining power is below interrupt alert threshold, the ALR pin will generate an interrupt at the beginning. After the battery remaining power grows higher than interrupt alert threshold (due to discharge) , another interrupt will be generated when the power again falls below the threshold (due to discharge). If the clearInterrupt() is not called after the interrupt is occurred, the ALR pin will remain low regardless of the statue of the battery. 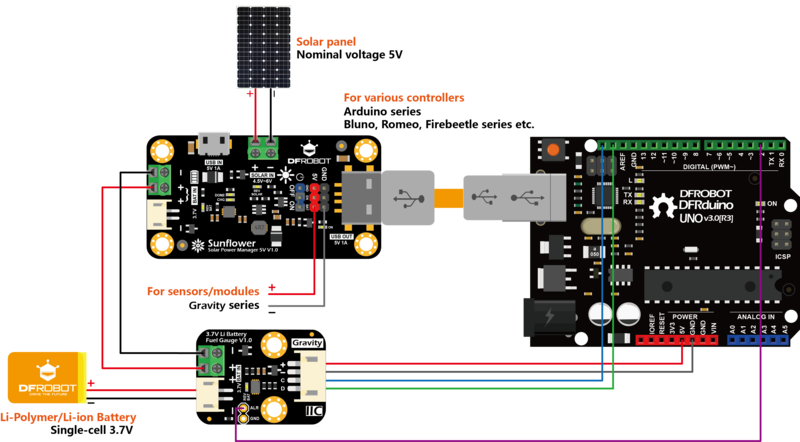 Gravity: 3.7V Li Battery Fuel Gauge can be used with the Solar Power Manager 5V to build a solar power management system. The battery fuel gauge can be used to monitor the charging of the battery with a solar panel in real time during the day, and the power consumption of the system during the night. Users can write their own code to record or print battery voltage and remaining power data, which can be employed to evaluate the "power balance" of the solar system in a day or even several months. These datum helps users to determine whether the nominal power of the panel or lithium battery power is large enough to fully support the entire system during the day and night. The low power interrupt alert of the fuel gauge and controllable 5V power supply of the solar power management module can be used to save power when the battery power is lower than a specified threshold. The ALR pin will send an interrupt signal to trigger the controller to turn off the 5V power supply. This shuts off the power supply of external modules connected to the solar power module, and thus saves power. 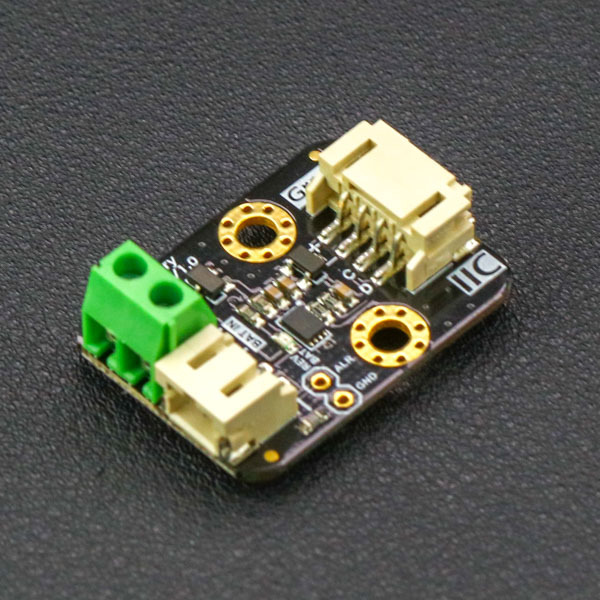 Get Gravity: 3.7V Li Battery Fuel Gauge from DFRobot Store or DFRobot Distributor.